Taste test: These are good, crisp barbecue chips, with a very sweet, sugary taste. There's no heat, and no aftertaste. Smell test: Regular barbecue chips smell. From the package: “Start Your Own Business” ... “Game Face is Master P's first release from The New No Limit/Universal Records. His first single, 'Ooohhhweee' is heating up the airwaves. 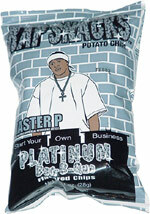 Master P continues to brand his name into other fields such as clothing, toys and films. Being named named the highest paid Entertainer in the Hip-hop Industry by the Guiness Book of World Records proves that his hard work has paid off.